The Best Bach In Town! This Bach has all the simple pleasures you need for a great time away.... A fresh, sunny, simple property with a large deck and shelter from the summer rain. This property is the perfect beach getaway for the family. 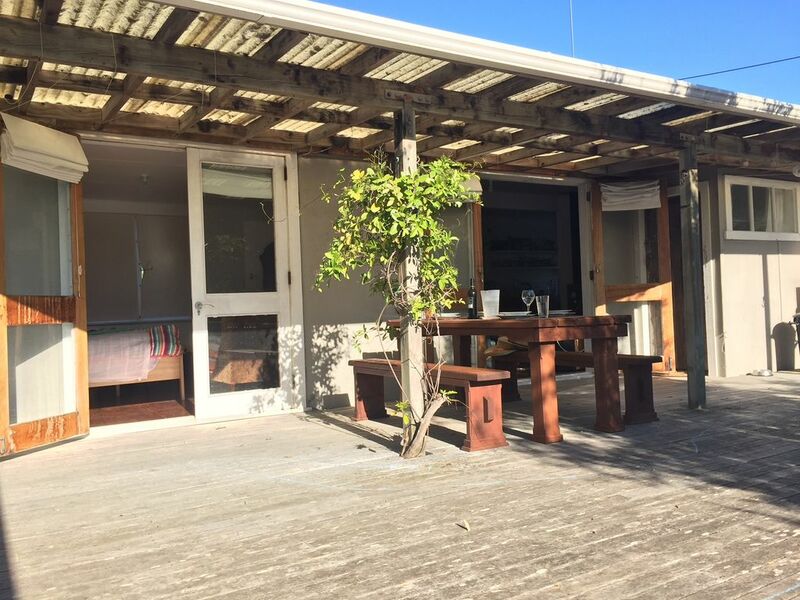 As well as inside shower, this great kiwi bach has an outside bath and shower, large decking area, petanque pitch, fruit trees and plenty of activities and games to keep the whole family entertained. A partial roof over the decking area ensures you can still spend time outside no matter the weather and our cosy fireplace makes sure this Bach is definitely the best place to be to enjoy the colder days at Waitarere. A quick 5-10 minute walk from this quiet street and you are on the beach or enjoying a walk through the forest. The Bach also has a TV but is not connected to any free-to-air channels. Guests will need to bring their own Sky Box, Leads and remote. A fantastic place to unwind and just relax. All guests must treat the property and our neighbours as a family friendly property. No loud music, no partying and no large groups to be on the property. Pets are welcome to stay so long as they stay outside on the deck. Property is not fully fenced. Owners must clean up after their pets, including removing all toiletings from the property and ensuring all areas are animal hair free and clean when finishing your stay. Childs Stroller available on request. Really lovely example of a classic kiwi Bach. Kids loved the outdoor bath. Great hospitality from host. Excellent communication. great location private outdoor area . enjoyed our stay. Great stay, clean comfortable. Had some good board games for kid's and our dog's had a great time also. Was in a nice quiet street, with an easy walk to the four square. Kids enjoyed the outdoor bath. Would have been good if it had freeview and duvet inners.